Banks can implement five models to transition to open API banking. London, 30 November 2016 – The use of open application programming interfaces (APIs) is common, even fundamental to the growth of digital leaders such as Amazon and Google, but the role of APIs in retail banking is quite a recent phenomenon. In Europe, the revised Payment Services Directive is a strong driving force for the payments industry to adopt open APIs, as banks have to allow third-party providers free access to payment accounts. The question is, how can banks monetize the required investments in APIs and open banking? 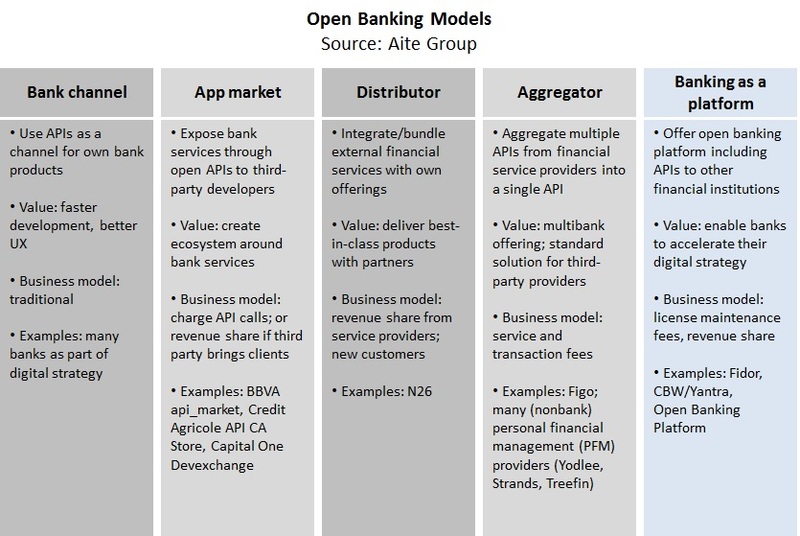 This Aite Group report overviews the development of open banking and describes API market trends and business models. Based on Aite Group interviews with 20 executives from leading banks, technology companies, and industry organizations, this report identifies banks’ challenges, opportunities, and threats as they change toward API banking. This 39-page Impact Report contains 17 figures and four tables. Clients of Aite Group’s Retail Banking & Payments service can download this report, the corresponding charts, and the Executive Impact Deck. This report mentions AIB Group, Alpha Payments Cloud, Amazon, Apple, Atom Bank, Authorize.net, Bank of Ireland, Barclays, BBVA, BBVA Compass, Braintree, CBW Bank, Citi, Cloud Elements, Credit Agricole, Danske Bank, Deutsche Bank, Deutsche Postbank, Dwolla, Euro Banking Association, equensWorldline, Facebook, Feedzai, Fidor, Figo, First Data, Google, HSBC Group, ImaginBank, Ingenico Group, LaCaixa, Lloyds Banking Group, Mastercard, Modo, Moven, Mybank, Nationwide, N26, Netflix, Nets, Open Bank Project, PayPal, Plaid, Programmable Web, RBS Group, Santander, Simple, Stack Overflow, Strands, Stripe, Synchrony Financial, TransferWise, Treefin, Vantiv, Visa, Vocalink, WeBank, Worldpay, Xero, Ximedes, Yantra, and Yodlee.